Charming odes to traits like Mom's center of strength and Dad's "jelly center." Celebrating the full picture of parenthood, these mugs feature Sandra Dumais' playful heart illustrations that offer refreshingly honest looks into mom- and dad-ism. Inspired by her own experiences as a parent, Sandra hand sketches, paints, and digitally draws a narrative interplay of words and images. The result: odes to traits like Mom's center of strength and Dad's "jelly center" that make positively charming character studies. Mugs made in China. Decorated in Edina, Minnesota. Click to view the artwork for Father and Mother. Looking for more of the family? 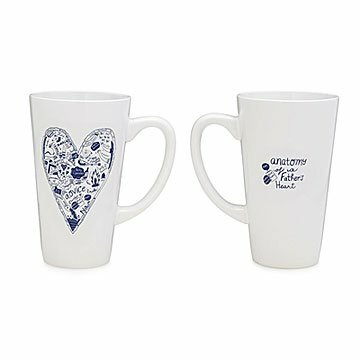 Click to see our Anatomy of a Grandparent's Heart Mug, Anatomy of a Sister's Heart Mug, and Anatomy of a Best Friend's Heart Mug. This was a perfect Father's Day gift for my dad, the man who already has everything. What he really appreciates are gifts that provide tangible reminders that although his kids are grown and live far away - that we still think about him and love him. As as avid coffee drinker, this was a great everyday reminder that we care and miss him. My niece loved this gift. Got this as a mother's dat gift for my mom who loves her coffee and hot chocolate. She just loved it!! This mug was included in a gift basket with coffee-themed t-shirts, gift cards, magnets, etc. Very well received Mother's Day gift.